Versatility From the smallest jobs to the largest, BENNU scaffolding platforms save you time and money. Continuous Climb Series #3 Finish walls faster with the new Bennu Hydraulic Mast-Climbing Scaffolding Platform Series #3 units. Bennu Hoist Allowing material hoisting to levels up to 200 ft. high. Configurability Modular units, 8 ft. and 4 ft. half wings and forward extensions allow you to reach those hard-to-get places. Continuing Innovation New redesigned base and tower to continuously raise and lower the self-leveling scaffolding platform safely and efficiently. Welcome to Bennu Parts and Service Inc., the only authorized manufacturer of the BENNU™ scaffolding platform system. The Series 3 Continuous Climb Hydraulic Work Platform allows users to continuously raise and lower the self-leveling scaffolding safely and efficiently, with the push of a button. This continuous-climb operation saves time and money by quickly putting the work platform at the height needed. Multiple safety features, such as a redundant manual backup, spring-loaded safety dogs and an internal hydraulic brake, give operators confidence that the platform is always safe and level. Bennu Parts & Service rents and sells mast-climbers, parts and accessories. 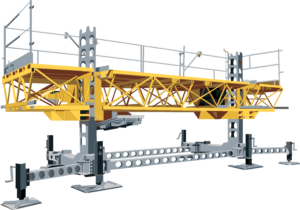 Using the BENNU™ Layout Software, expert technicians are available to assist with designing difficult scaffolding layouts. With a drastic reduction in setup time, and an increase in the masons’ speed and efficiency in laying brick, these new power units save an estimated 40% over pipe scaffolding and 20% over other hydraulic platforms. 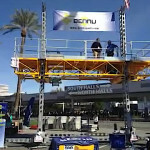 We recently showcased our scaffolding work platform at the World of Concrete in the Las Vegas Convention Center. View our photos and videos here. Whether you are a first-time buyer, or looking to add to your existing fleet, Bennu Parts & Service has the experience you need. We also have a complete inventory of all BENNU™ parts and accessories. For more information, please email or call us at 847-595-8444.